Our purpose and mission is to bring health and healing to as many as possible in our communities and our families and friends. We all have the potential for healing if the barriers and blocks to health are removed and the body is allowed to do what it does best…heal! At ABC Family Chiropractic and Wellness, we provide you with the tools to obtain optimal health and wellness and work together with you to determine what are the underlying causes of your symptoms or dis-ease. Through our gentle, non-invasive tests and evaluations, we will design the right program for your health and wellness. We offer Chiropractic and Holistic Nutrition utilizing Nutrition Response Testing® and Morphogenic Field Testing to assist the body in healing. Dr. Mark Potter, (Chiropractor) has been serving the community for over 30 years. His gentle, light force activator adjusting is tailored to fit each unique individual, from infants to their great-grand parents. Karen Potter, MS, HHC is the Holistic Nutritionist, bringing her years of experience in the field of nutrition to the community as well. Don’t Wait! ABC Family Chiropractic and Wellness Can Help! Our talented, friendly staff and warm environment reflect our commitment to your overall wellness. If you’re ready to live your healthiest life, give ABC Family Chiropractic and Wellness a call today. 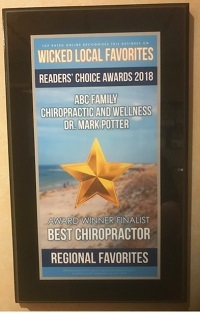 ABC Family Chiropractic & Wellness was voted Best Chiropractor as a Regional Favorite in the Readers' Choice Awards for 2018. Health and wellness articles published by Dr. Mark Potter, Arlington Chiropractor. Subscribe now. Heal your Body/Heal your Brain! To follow up the excellent docu-series “Broken Brain” there are many reasons the brain gets broken and people suffer from depression, Alzheimer’s, ADD, ADHD, and anxiety, etc.! Come learn how to identify the underlying causes of your broken body/broken brain and fix it! The myths and truth about weight loss! How to lose weight without dieting!! Come and learn what makes you fat and what to do about it! This workshop will help you understand the underlying causes of weight loss and weight loss resistance! If you are seeking greater health and wellness, then this workshop is for you!